Boeing is confirming that a section of the underbelly of an Air India Dreamliner came off during landing, though spokesman Doug Alder will not say whether the plane is the newly delivered VT-ANO, as the Times of India reported, or a Dreamliner delivered ten months ago. The panel "was recovered at the airport," Alder said in an email, reiterating what he said when the story was first reported that there was no safety of flight issue. The event occurred on October 12. on a passenger-carrying flight from Delhi to Bangalore with 148 people on board, according to the paper. The identity of the aircraft is important because VT-ANO had been in the airline's possession for not yet a full week. If the damage was on VT-ANO, that would be the very same airplane that earlier last week was sitting in Charleston, South Carolina, outside the (also brand spankin’ new) Dreamliner assembly facility waiting for Air India to come and get it. That panel on that plane had been opened recently in Charleston, to perform a modification to the environmental control unit, a Boeing-ordered fix to all 89 of the airplanes, to drain a build up of moisture that was interfering with the cooling of electronics. If the skin came off VT-ANO, then a lot of folks are running around the North Charleston plant collecting all the paperwork related to that work to find out just how the panel - which is attached with screws and locking bolts - came free. The same can be said in Delhi, if the panel was disassembled at Air India. Clarification of just what plane this happened on is not forthcoming, though the Directorate General of Civil Aviation is said to be investigating. An experienced airliner mechanic knowledgeable about the Dreamliner suggested the only way the panel could have come off is if it was put on with the wrong attachment bolts. With each part of the airplane carefully mapped on engineering diagrams and the appropriate hardware placed at the assembly station, it is hard to imagine how that could have happened. Clearly though, something went amiss on this airplane. The follow on questions of course are; Just this panel? Just this airplane? “If the bolt is too short the nut barely captures the threads. It will tighten up but come loose quickly because of the pressure,” my source told me. If you are wondering, as I was, how the plane made it half way around the world without losing this piece I was told that the plane is designed to fly with 25 percent of fasteners missing. "Even if they forgot to tighten the nuts, the panel would not fall off. It would fall off if they put in screws that were too short," my contact told me. As the one who does the household repairs at my home, I confess, sometimes I substitute whatever I can find lying around the work room for original parts. If it fits and holds, I figure that's good enough. This is a bad idea when attaching fuselage panels to airliners. Here's why. “There is a locking feature at the end of the nut. For it to work, the threads of the bolt have to protrude 2-3 threads,” my Dreamliner mechanic explained. “Put the torque gun on and it will click, it will show that it (the nut on the screw) is tightened up.” But its not. Drum roll here. It should not take too long to figure out what happened. Not so sure we can say the same about determining why it happened. Earlier this month, the Charleston assembly plant boss Jack Jones called workers together for an all hands meeting. Quality standards would have to improve, he told them according to someone who was present. Confirming what I reported in my post about commercial airplane division boss Ray Conner's round the world apology trip, Jones told workers that senior executives at Norwegian did an analysis for Conner that predicted future Dreamliner failures. The mathematical calculations concluded with this stunning figure; With all the maintenance, diversion and reliability problems, the Dreamliner was costing the international low cost carrier fifty as in fifty percent more to operate than anything else in their fleet. 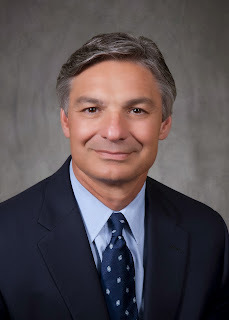 Lasse Sandaker-Nielsen, a spokesperson for the airline would not confirm the figure but did say that as far as fuel efficiency is concerned the Dream is living up to Boeing's promises of twenty percent savings. Until the U.S. government shutdown, inspectors with the Federal Aviation Administration were reviewing each and every airplane off the assembly line. I am told, they said they would not leave Charleston until the planes passed inspection with two or fewer write-ups. Instead the South Carolina 787s are garnering 20, 30 and 40 write-ups. "We're not getting better, we're getting worse," Jones reportedly told the workers. From India, Qatar, Chile, Norway, Poland and Japan the chorus of complaints is getting louder. What will it take for Boeing to heed what they are saying about quality control? SEE THE UPDATE ON THIS POST BY CLICKING HERE. Also, if VT-ANK was returned to service so quickly, there couldn't have been some sort of failure right? Maybe it was a maintenance oversight? I would like to get more information before jumping to any conclusion. I advise you do the same. Joe, The registration number comes from a Times of India account. The overriding point is that quality control issues continue to pop up with this airplane and in both assembly plants. Other models may survive it, but manufacturing and reliability issues added to the the battery issue threaten to overwhelm the Dreamliner. Christine, you miss Joe's point. It was a removable panel. Do we know that Air India mechanics did not have that panel open after they took delivery? Are you not assuming that Air India took delivery of a brand new aircraft and did not touch it? That might be an incorrect assumption, as it is quite common for mechanics to open up new aircraft to verify and check things, and sometimes to provide training on the new aircraft to their people. Christine, you should know better. Journalistic integrity comes from getting the details right, and not merely rehashing information from mainstream sources (e.g. Times of India), who often know very little about aviation and care even less about fact checking (e.g. getting the planes registration right). The 787 has its share of teething issues, as have other new planes in recent memory (e.g. A380). It is certainly right of you to point out those issues, but at what point do you cross the line from a being a concerned reporter to one whose objectivity is compromised by what appears to be an obsession for opportunities to perpetuate your agenda against the 787? Paul, with all due respect, there is a chorus of complaints about the 787 coming from the folks shelling out the money to buy them. I'm not instigating these complaints, I am reporting and opining about them. That's what bloggers do. Christine, nobody is criticising you for believing the incorrect information on the aircraft identity published by the Times of India. But, having had the error pointed out to you, to claim that it's irrelevant whether it was a newly-delivered aircraft or one that had been in service for nearly a year doesn't stand up to scrutiny. Having said that, rumours are flying around the industry that no such panel "fell off" the aircraft in flight. 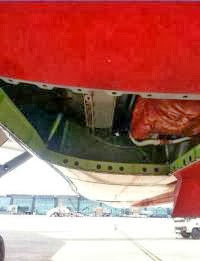 The fasteners that hold this panel on do not simply fail without causing damage to the corresponding anchorages on the aircraft structure - and yet the replacement panel was fitted without any problem as soon as it had arrived at Bangalore after being removed from the donor aircraft. There is speculation that the reason why, strangely, we haven't so far seen any photos of the panel, which has been supposedly found on the airfield at Bangalore Airport, is that it was already missing when the aircraft left Delhi. An Air India mechanic at Delhi has been suspended in connection with the incident. If the scenario turns out to be correct, it remains to be seen what will happen to the flight crew as well, given that nothing was picked up on the preflight walkaround. Lots of Air India's 787s were built at Everett, there's a good photo record in the archives at kpae.blogspot.com and they are continuing to work thru the backlog there. VT-ANG flew on the 15th, for example. So there is a "chorus of complaints". What about British Airways, China Southern, Hainan, Lion Air, Qantas, even Ethiopian? We've not heard a peep from them. And Ethiopian suffered that ELT fire! Why would these airlines' experiences be any different to the others? Why is their silence never mentioned, but the "chorus of complaints" always regurgitated in every single article regarding every single minutiae surrounding 787 operations? Is it perhaps that the 787 (battery fires not withstanding!) is going through completely normal teething problems but that we hear more about each and every niggle than ever before because of the 24/7 nature of the media, social media and rapid reporters out for their hunk of meat? So many of the issues reported regarding the 787 are trivial at best, yet they get headline status. For example: Brand new planes divert for faulty oil pumps or sensors all the time. But for some reason, only the 787 is reported on. I have very little faith in anything I read on sites like yours these days, as everyone seems to have some sort of agenda and will always go for the throat.